How time and our spacecraft fly – especially when you're making history at 32,000 miles per hour. A KBO among the Stars: In preparation for the New Horizons flyby of 2014 MU69 on Jan. 1, 2019, the spacecraft’s Long Range Reconnaissance Imager (LORRI) took a series of 10-second exposures of the background star field near the location of its target Kuiper Belt object (KBO). This composite image is made from 45 of these 10-second exposures taken on Jan. 28, 2017. The yellow diamond marks the predicted location of MU69 on approach, but the KBO itself was too far from the spacecraft (544 million miles, or 877 million kilometers) even for LORRI’s telescopic “eye” to detect. 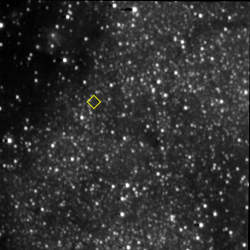 New Horizons expects to start seeing MU69 with LORRI in September of 2018 – and the team will use these newly acquired images of the background field to help prepare for that search on approach. Continuing on its path through the outer regions of the solar system, NASA's New Horizons spacecraft has now traveled half the distance from Pluto – its storied first target – to 2014 MU69, the Kuiper Belt object (KBO) it will fly past on Jan. 1, 2019. The spacecraft reached that milestone at midnight (UTC) on April 3 – or 8 p.m. ET on April 2 – when it was 486.19 million miles (782.45 million kilometers) beyond Pluto and the same distance from MU69. "It's fantastic to have completed half the journey to our next flyby; that flyby will set the record for the most distant world ever explored in the history of civilization,” said Alan Stern, New Horizons principal investigator from the Southwest Research Institute in Boulder, Colorado. Later this week – at 21:24 UTC (or 5:24 p.m. ET) on April 7 – New Horizons will also reach the halfway point in time between closest approaches to Pluto, which occurred at 7:48 a.m. ET on July 14, 2015, and MU69, predicted for 2 a.m. ET on New Year's Day 2019. The nearly five-day difference between the halfway markers of distance and time is due to the gravitational tug of the sun. The spacecraft is actually getting slightly slower as it pulls away from the sun's gravity, so the spacecraft crosses the midpoint in distance a bit before it passes the midpoint in time. 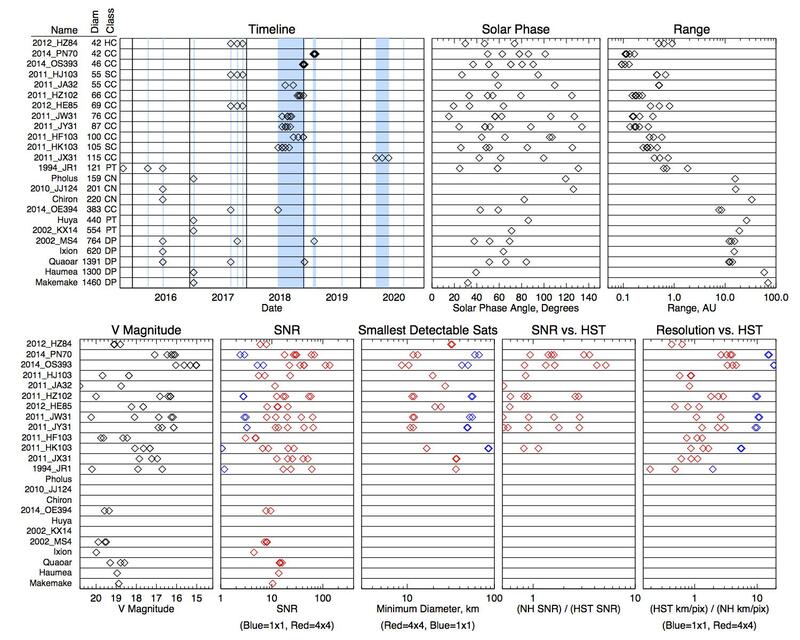 The scheduled 157-day hibernation is well-deserved; New Horizons has been "awake” for almost two and a half years, since Dec. 6, 2014. Since then, in addition to its historic Pluto encounter and 16 subsequent months of relaying the data from that encounter back to Earth, New Horizons has made breakthrough, distant observations of a dozen Kuiper Belt objects (KBOs), collected unique data on the dust and charged-particle environment of the Kuiper Belt, and studied the hydrogen gas that permeates the vast space surrounding the sun, called the heliosphere. "The January 2019 MU69 flyby is the next big event for us, but New Horizons is truly a mission to more broadly explore the Kuiper Belt,” said Hal Weaver, New Horizons project scientist from APL, in Laurel, Maryland. "In addition to MU69, we plan to study more than two-dozen other KBOs in the distance and measure the charged particle and dust environment all the way across the Kuiper Belt.” New Horizons is currently 3.5 billion miles (5.7 billion kilometers) from Earth; at that distance, a radio signal sent from the operations team – and traveling at light speed – needs about five hours and 20 minutes to reach the spacecraft. All spacecraft systems are healthy and operating normally, and the spacecraft is on course for its MU69 flyby.